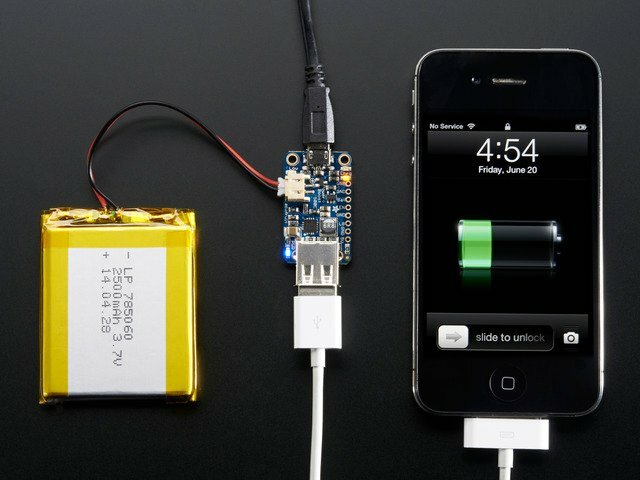 This is a simple soldering project with just a few connections required. We know you’re eager to get started, but don’t rush into it…most importantly, do not install the USB jack on the PowerBoost! We’ll be wiring to the PowerBoost directly. 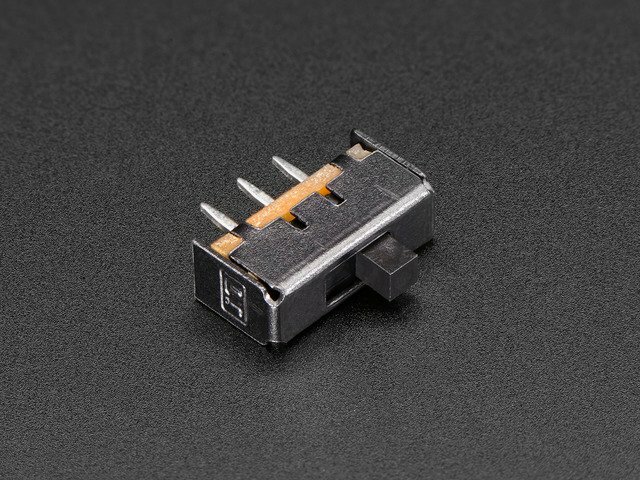 DO NOT install the USB jack on the PowerBoost! Cut the fan wires to about 2 inches (50 mm) long. Strip a little insulation and tin the ends of the wires. Tin the legs of the switch and strip & solder two wires: one goes to the middle pin, the other goes to either of the two outer pins; the third pin is not connected. Then trim the wires to about 2 inches long and strip & tin the ends. You can use the wire leftover from the prior step. For later reference: the switch is “off” when moved to the two-wires side. Optional but recommended: heat-shrink tubing reinforces these connections so they won’t break off later. Use it if you got it! Solder the wires from the fan and switch as shown in the circuit diagram at the top of this page. The two wires from the switch connect to the EN and adjacent GND pin on the PowerBoost board. The order does not matter; either wire can go to either pin. After soldering, trim any protruding wires from the underside of the board. We need it sitting as flat as possible inside the case later. You also shouldn’t have big gloppy solder joints…clean it up if you do, try to get a fairly smooth underside. That’s all the soldering! Let’s give it a test before putting everything inside the case. Plug in the LiPoly battery into the PowerBoost and flip the switch to the “on” position. You should get a blue LED on the PowerBoost board and the fan should start blowing. If no blue LED or fan: check the switch position (remember, the two-wires side is “off”). Or the battery may simply need to be charged. Plug in a microUSB charging cable (to a powered USB hub or phone charger) and allow it to top off. It’s okay to test the fan and power switch while charging. Check the sides of the fan…on one face should be an arrow indicating the airflow direction. Confirm that the fan is in fact blowing in this direction…if not, you may have the + and – wires reversed. Do not continue until you have a working circuit. If everything works, you’re done soldering and can switch off your iron. This guide was first published on Feb 13, 2016. It was last updated on Feb 13, 2016. This page (Soldering) was last updated on Apr 19, 2019.